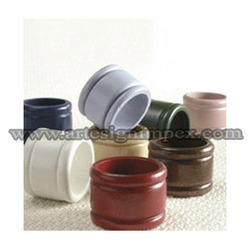 Manufacturer and Exporter of Wooden Napkin Rings. Our product range also comprises of Candelabra, Napkin Rings and Decorative Lanterns. Our offered range of these wooden napkin rings is extremely attractive in look and enhances the charm and look of the dining tables. These are available in various colors, designs, and patterns which will also be modified as per the choice and demands of the consumers. Our range of these products has gained a huge appreciation for its environment friendly characteristics like excellent performance, elegance and longer service life. These are made using optimum quality material and are made in order to meet the quality standards of the industry. Looking for Wooden Napkin Rings ?